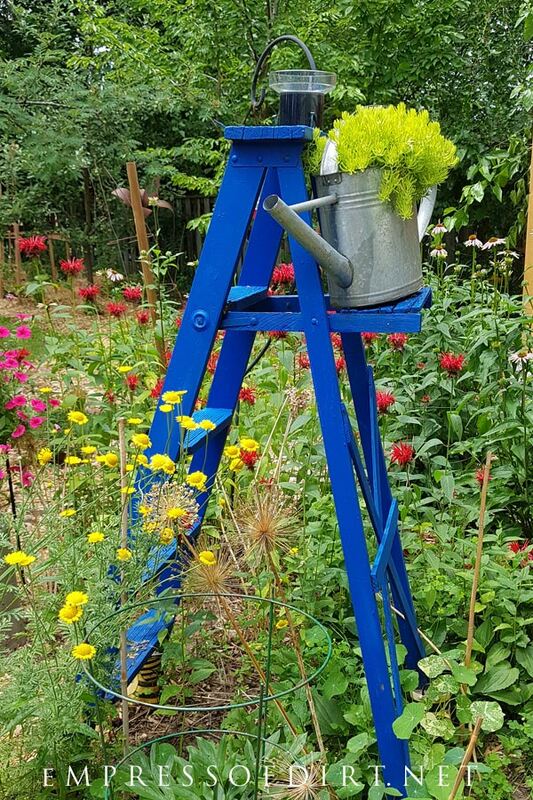 Old wood ladders are wonderful in the garden. 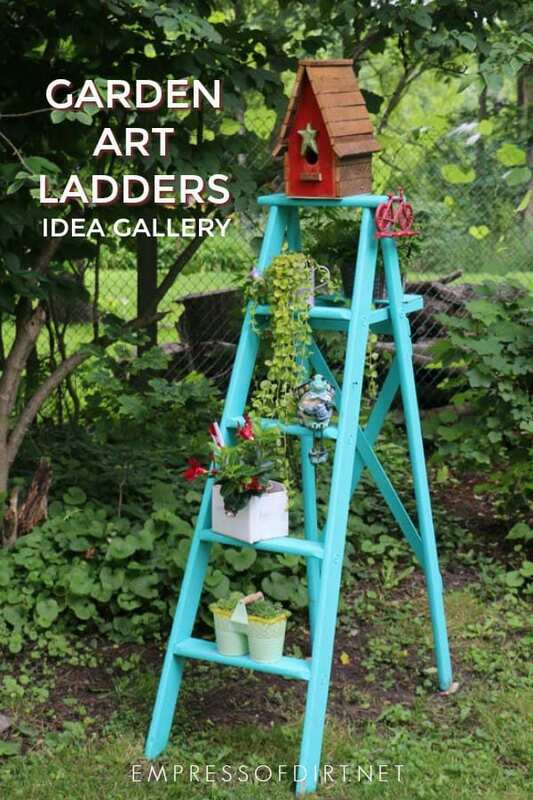 Have a look at these ideas for turning ladders into functional garden art. 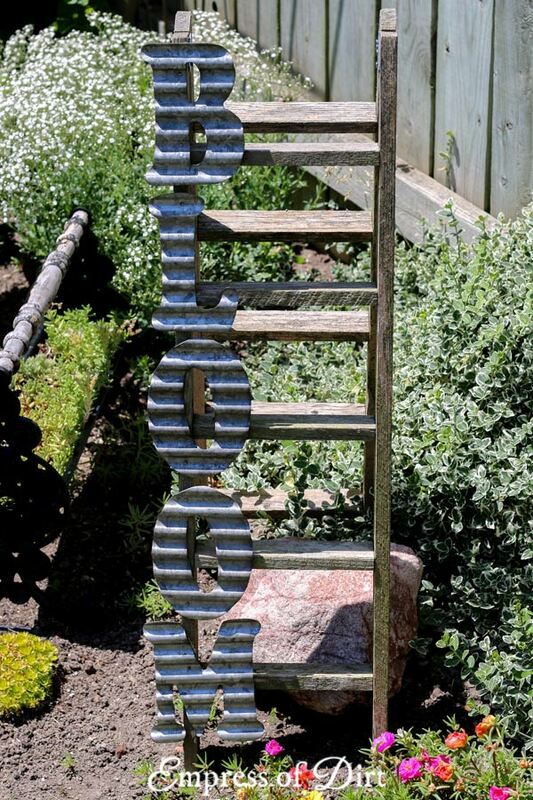 Use them as trellis, planters, herb growing, and decor. 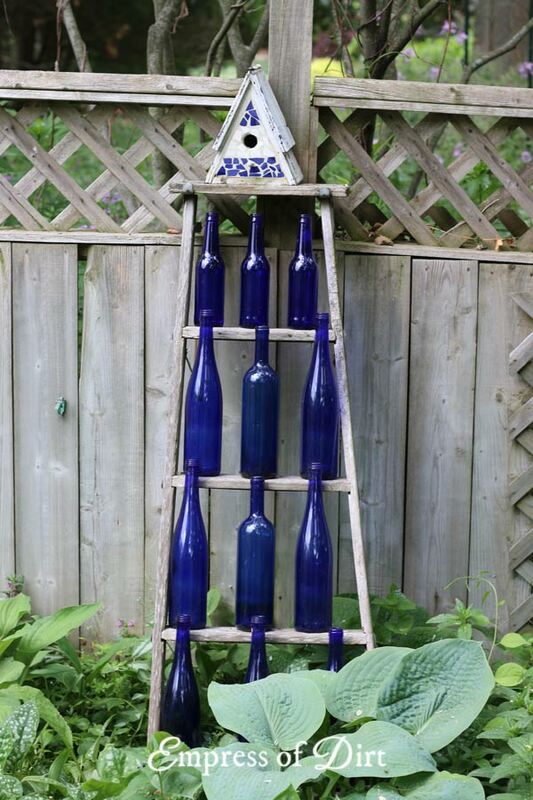 For more, also see garden art project ideas. 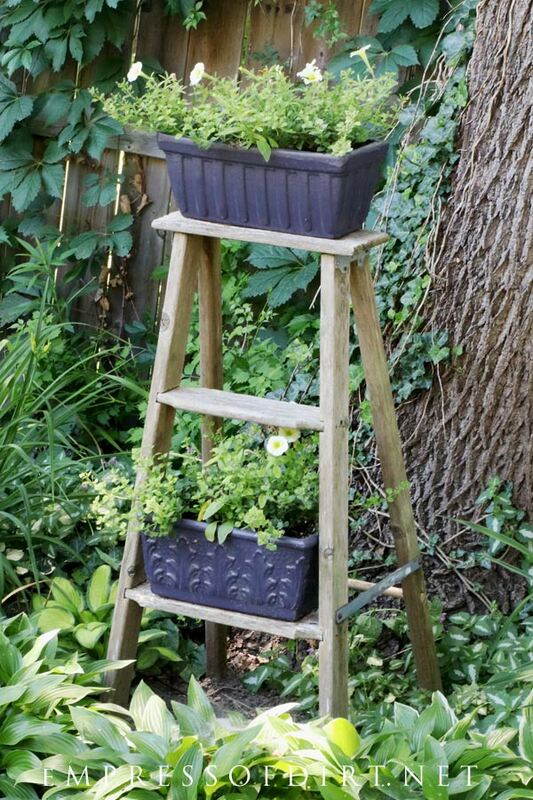 Wobbly, old wooden ladders have lots of reuses both in the home and the garden. 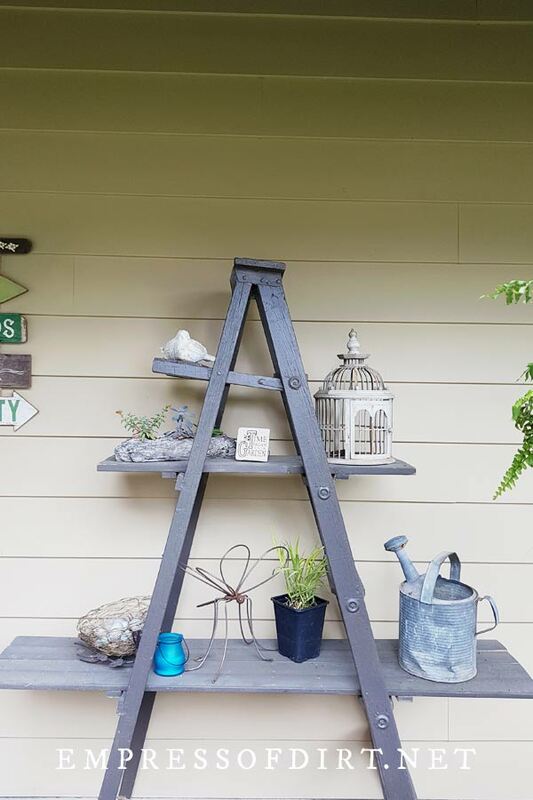 Here you’ll see them used outdoors as stands for plants and decor, adding vertical interest to the garden the same way arbors, trellis, and obeslisks do. If you ever see one in the garbage, snap it up! Their value is starting to be recognized and resellers are asking a little too much for them these days. 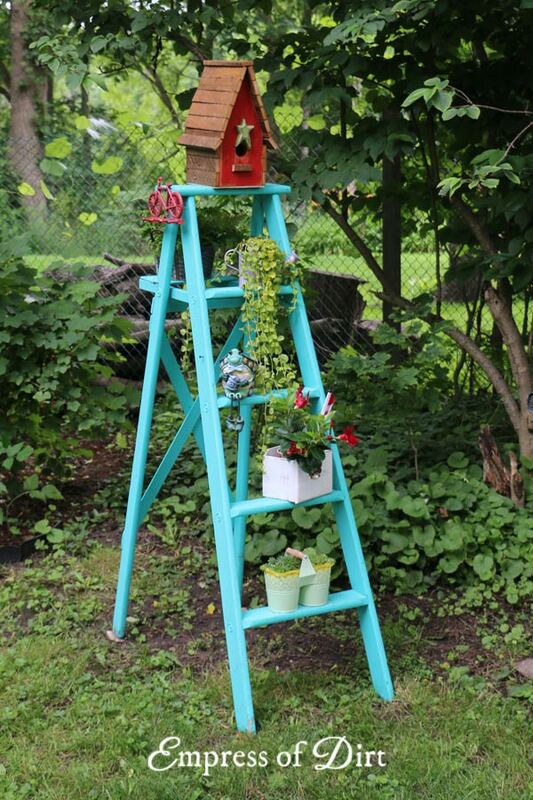 Whether you paint them or leave them plain, wooden ladders make a quirky, fun garden art accent. 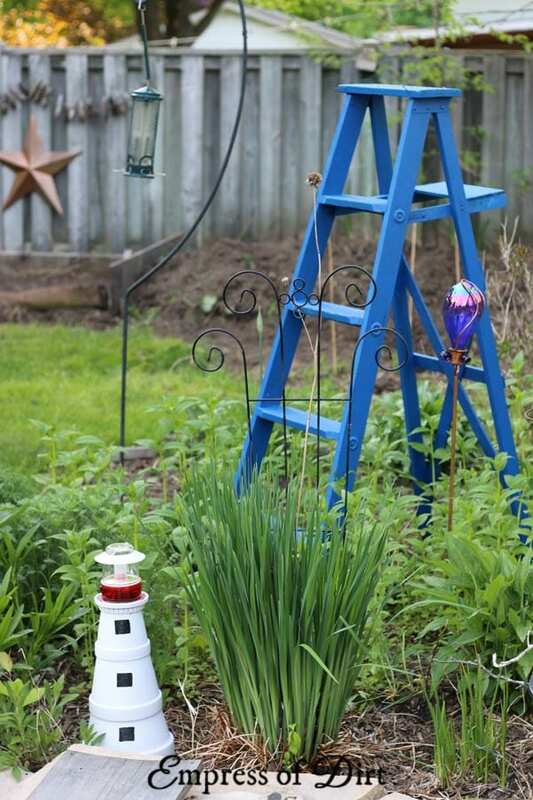 Old-fashioned household ladders made from wood are not durable in outdoor conditions. 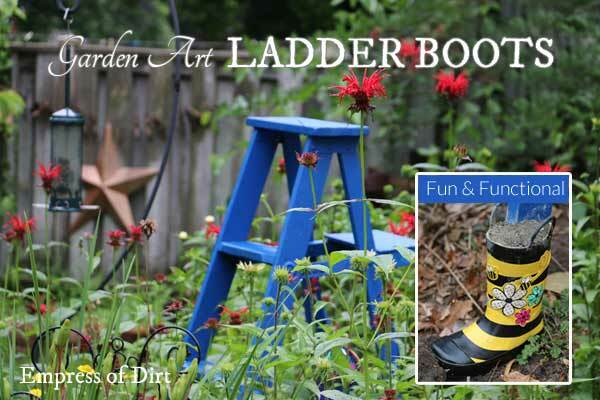 To make a ladder last for years outdoors all year-round, consider painting it with exterior latex paint and adding rain boots! 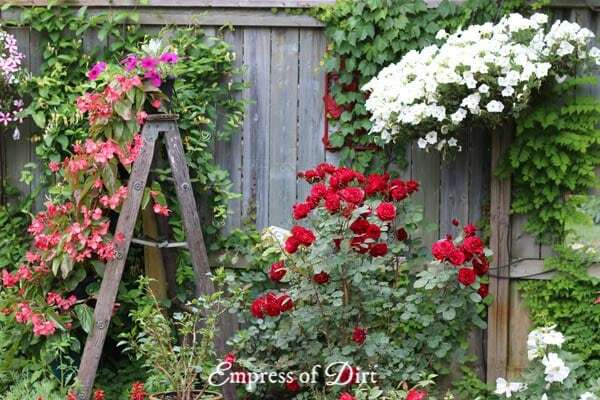 This will prevent rotting due to exposure to the damp soil, rain, and snow. Eye-popping colour is always good! 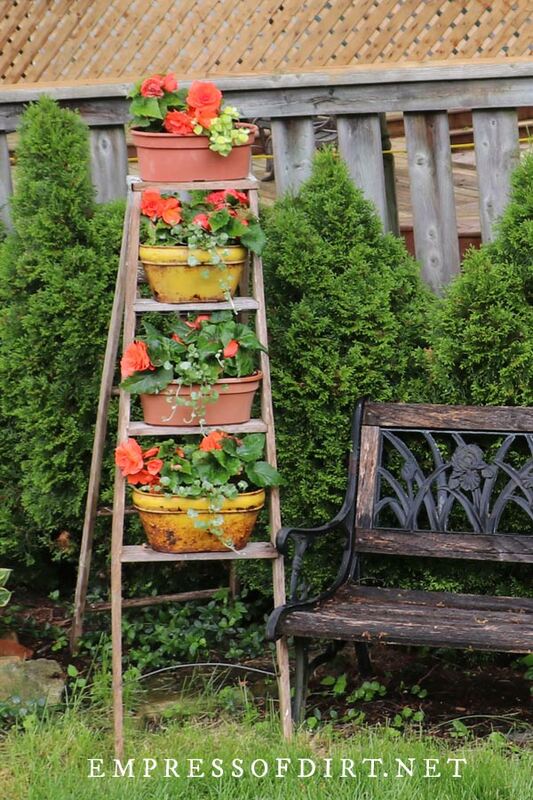 See how they placed the flowering annuals along the ladder? Very pretty! 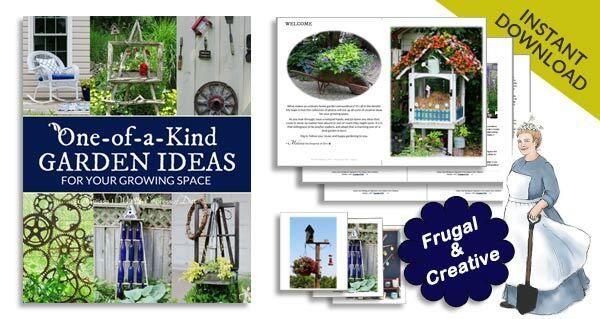 Sign up for the free newsletter for fresh ideas! Hi, Empress Melissa, I have been gifted with some broken sidewalk and old bricks from a neighbor’s garden remodel. I am wanting to make paths or a “landing” for my Garden Shed. How do you move these heavy pieces of concrete around to attain the beauty of a garden walk? I have the idea of the walk, but not the know-how to get the job done. Any ideas for me? Also, when moving stones etc, it helps if the ground is covered in sand. This makes the heavy stones slide when you push them. Hope this helps. Hi Cher, It’s tricky if your strawberry jar is ceramic or clay. I have overwintered some fairly fragile, large potted plants within the garden by wrapping them in scraps of thick foam (from a foam mattress) and then wrapping the whole thing in a plastic tarp (to keep the foam from getting musty). You will want to water deeply before the frost sets in and, you have to keep checking on it in the cold spring months. Give the plants air and sun and water during warmer spells and cover them up during colder times. Another option is surrounding the pot in straw. It’s the same process as growing veggies in cold frames during the winter except you have the extra precaution of having to insulate the pot. Let me know if you try it and please forgive me if it doesn’t work! I am SO glad I opened this page of yours!! 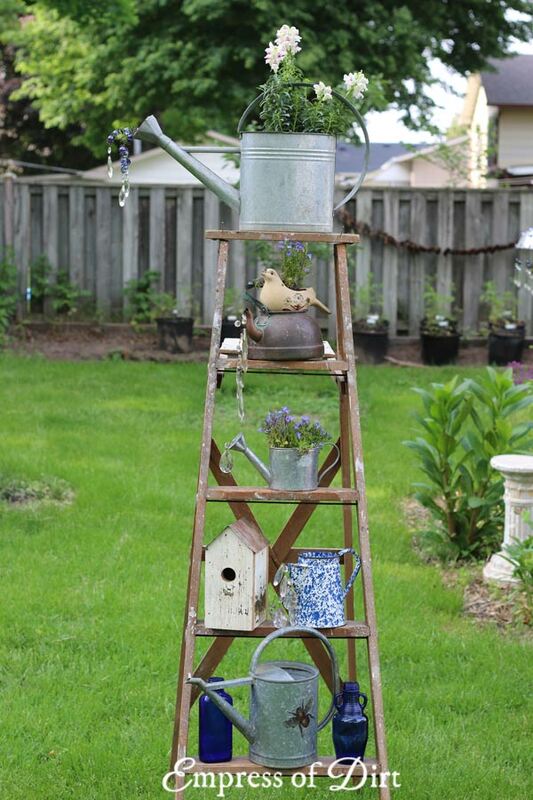 I have about 10 bird houses I am wanting to hang but want them in a safe area from cats, raccoons etc. AND I also have two old half ladders the neighbors were getting rid of that I snagged!! I now know what do to with both! Thank you so very much ?? Thanks Some really good ideas! These are beautiful!! Love the first one especially. 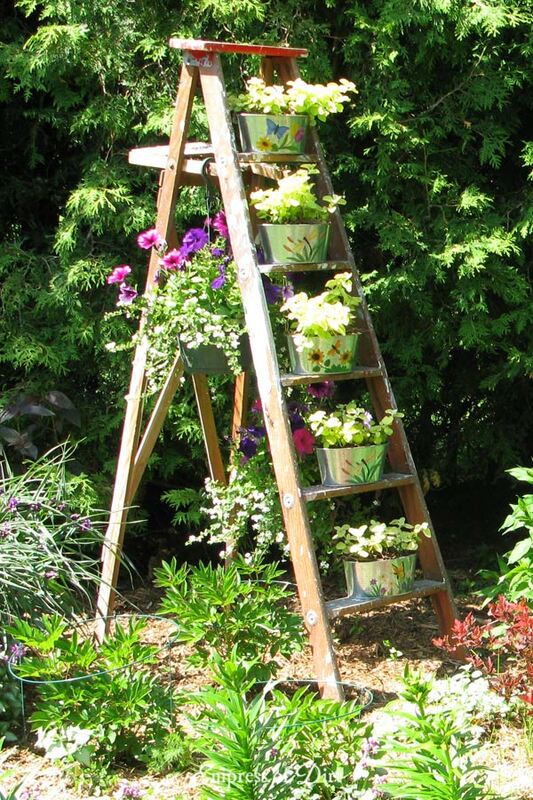 But this is a great idea, and I will be looking for a ladder in the coming months. It’s true, some people do not realize they are holding treasures in their hands! Thanks for the pub, Melissa! Great collection!